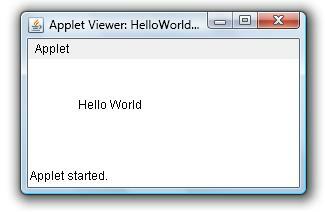 This java example shows how to create and run Hello World Java Applet. * Applet can either run by browser or appletviewer application. * window is minimized and then restored. * method to print the string at specified location x and y.
I am super new to Java and already have problems with codes in general, well i am still learning! Can you explain why i got this error and what can i do to fix it? Compile correct but when i run the error shows.